I wanted to start my revitalised blog by writing about some of my work interests. This post is all about our footprinting, economics and decision making. It’s some loose thoughts I’ve been playing with. I’m interested in the question of how we can shape our economy to achieve a better harmony between our ecological, social and financial interests. I’m going to call this a One Planet Economy1. When discussing this, language is important and in this post, I want to challenge the way we use the terms economy and footprinting and present novel ways of talking about them and understanding their relationship. I’ll argue that this is essential if we are to make serious steps towards creating a healthy, One Planet Economy. 2. A footprint is the ripple created on the fabric of our economy which has financial, social and environmental dimensions. As we will explore in a moment, by broadening the concept of the term footprint, it enables us to have a more connected understanding of our relationship with nature, financial systems, environmental systems, and each other. When defining the term footprint, I referred to the fabric of our economy. Conventionally, definitions of economics are concerned with the production and consumption of goods and services, the supply of money, and what state of health these are in. Whereas etymology tells us that the words ecology and economy share the same prefix, -eco, which comes from the Greek word: oikos, meaning home. Perhaps we could consider ecology as the study of our home and the economy is its management. Economics is therefore concerned with housekeeping which from personal experience, is about much more than money. To be good housekeepers, we seek harmony and health in the home. Financial The financial dimension of our economy is centred around transactions which occur when parties agree to the value of the transacted good or service. This is commonly expressed in a currency. Currencies usually rely on money as a unit of exchange and this has little intrinsic value as a physical commodity, but derives its value from being declared by the government as legal tender, where it is unlawful to not accept the currency as a means of repayment of debts. This concept is known as fiat money. Environmental The environment encompasses all living and non-living things on Earth. These “things” usually exist as interacting communities, which we call ecosystems. Ecosystems occur at different scales and are interconnected with each other. You will find microbial sized ecosystems that exist inside our gut, to river based ecosystems, all the way up to what we can consider a planetary-scale ecosystem in the Gaia hypothesis. This proposes that the planet can be viewed as a synergistic self-regulating, complex system that helps to maintain and perpetuate the conditions for life on the planet. There are various processes and interactions that take place in an ecosystem; these are called “ecosystem functions“. Some of these functions provide a direct benefit to humans and these are called “ecosystem services”. We would not survive without these ecosystem services and everything, including technology derives from it. For example, services such as climate control, pollution filtration, food and fresh water are critical to our existence. Social The social element of our economy is concerned with the relationships with ourselves and each other. When we fail to achieve a satisfactory social foundation, we experience human deprivation. What determines an acceptable social foundation is generally agreed through social norms and its elements include aspects such as happiness, cultural, status, beliefs, love, belonging, esteem and self-actualisation. All dimensions of our economy are critical for a society to exist and all of them get abused and chipped away by our collective failures and greed. 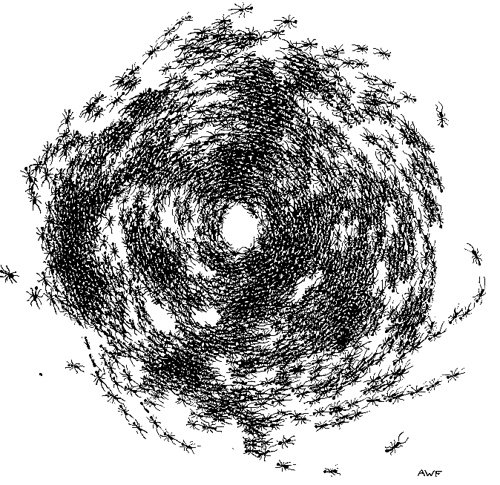 This will always be a struggle and in our gloomiest moments, we may feel like we’re stuck in an ant mill, the bizarre phenomenon whereby army ants get stuck in a spiral, committing mass suicide as they walk until exhaustion. Let’s not allow this. Humans have a stubborn determination, an incredible capacity to innovate and adapt, and so we should keep working, mindfully and consciously, towards something better. What else is there to do? Making decisions for a One Planet Economy requires a familiarity of issues across all three dimensions. Our educational system needs to instil these ideas into children, helping them know how to navigate and approach complex systems. Of the three dimensions of our economy, the environmental component, I would argue, gets the least respect from our leaders and decision makers. Our environmental interests are concerned with improving the relationship between human activities by retaining and enhancing ecosystem functions and services we draw from. A key concept in our environment is biodiversity, the variety of plant and animal life which makes up the building blocks of an ecosystem. As we simplify ecosystems, their ability to provide ecosystem functions decreases. Therefore the more biodiverse an ecosystem is, the more resilient it generally is to environmental perturbations and the loss of key functions are less likely. It’s common to hear people refer to their footprint as a size: from small to large. To have meaning, the method of measurement is usually relative, e.g. flying 10 miles having a greater carbon footprint than walking 10 miles. While an important measurement, it feels that people and organisations sometimes become too focused on carbon footprinting and forget a broader view of their footprint. When we define a footprint to mean “the ripple created on the fabric of our economy”, the language of size becomes inadequate. Instead we are examining the nature of that ripple which we know has financial, social and environmental dimensions. Then from this, we can adopt the right measures and targets to examine this ripple. So how might this work in practice? 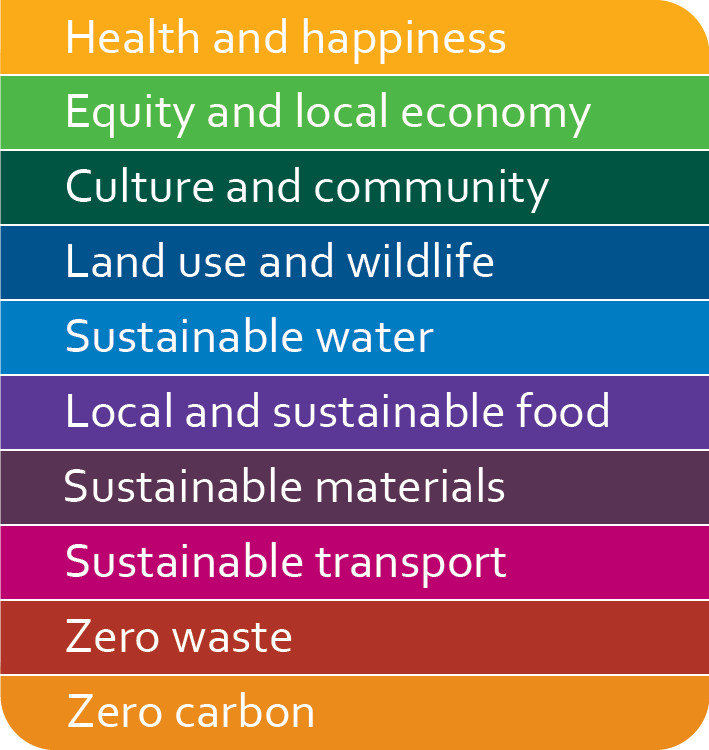 When working at Bioregional, I did some work with two local authorities which wanted to embed “One Planet Living” thinking into its decisions. This involved undertaking a triple bottom line assessments, working with the procurement teams and analysing the footprint related to everything the Council spent it’s money on. This covered carbon, ecological, pollution, water and even employment. Although rough, it gave insights into different components of their footprints, highlighting that the energy and transport footprint was an important, but small component of their overall footprint. 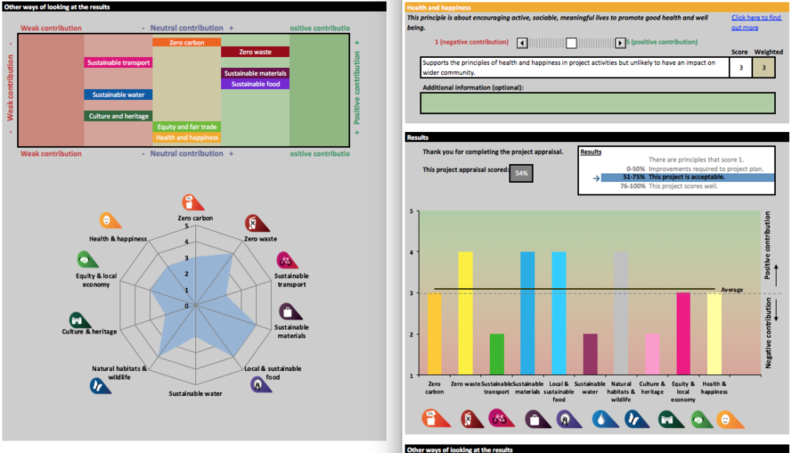 Following this, using One Planet Living as a framework, we worked with the the procurement team and strategy team to design tools that helped them assess whether strategic or procurement decisions were fitting with their ambition towards One Planet Living. The tool worked by giving scores to each One Planet Living category, which could be aggravated together. Firstly, there were minimum standards for each category. For example, under “Land use and wildlife”, if a project was deemed to have “a detrimental and destructive impact on natural habitats, resources or wildlife with no actions in place to mitigate and minimise these impacts” – then it would not be acceptable to proceed. When aggregating scores, you can get a clear picture of whether the project is controversial or not. It’s also possible to set minimum scores for projects to proceed and pit two projects against each other. 1. One Planet Economy isn’t a new term and most prominently if you search for it online, you find details of an EU funded project called the One Planet Economy Network. This EU project was about carbon and ecological footprinting measurement, which although relevant, it’s not what I’m writing about in this post. Next Post Does our farm sell the sizzle?